Richard Feynman famously described "Cargo Cult Science" as "follow(ing) all the apparent precepts and forms of scientific investigation" while lacking the essential ingredients: namely rigor and insight. 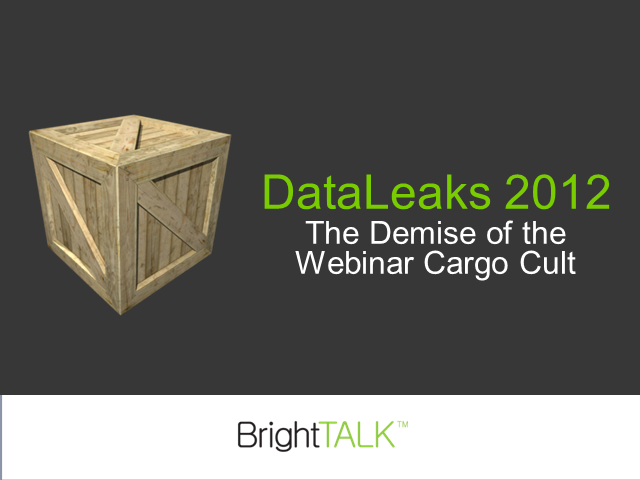 In this data intensive webinar, BrightTALK will dive deep into it's vaults to give real insight into webinar performance from 2008-2011. The goal of this presentation is to provide actionable insight into the state of play in the webinar industry and to finally dispel much of the mythos around webinar data. 1) What are the macro trends in the webinar industry? 2) Are there a few key insights that can make a presentation more impactful? 3) What does it feel like to have more than 13,000 attendees to your webinar? 4) What does a bad joke have in common with a Friday afternoon webinar?